A two-day workshop on Second National Language has been organized at Kopay Teachers’ Training College on 08th and 09th November. Governor of Northern Province GA Chandrasiri participated as Chief Guest at the inauguration ceremony of the workshop. Students of Trilingual Learning Center of Northern Province participated at this workshop. The construction work on the first phase of the Northern Expressway is scheduled to get underway this month. The four lane expressway will be built at a cost of approximately US$ 4 billion. 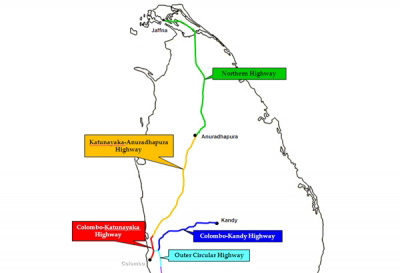 The Outer Colombo Circular Road, planned to be constructed from Enderamulla to Dambulla, will cover the main towns of Meerigama, Pothuhera, Kurunegala, Melsiripura and Galewela, under the first phase. The entry way to Kandy will also be constructed as a part of this phase. It will begin from Pothuhera and end at Gannoruwa. Project Minister of Highways, Ports and Shipping Mr. Nirmala Kothalawala said that the first phase of construction work will commence in Galewela, Galagedara, Rambukkana and Kurunegala later this month and is scheduled to be completed by 2018. Under the guidance of Governor of the Northern Province GA Chandrasiri, second Medical Camp for Non-Communicable Diseases was conducted for the members of Governor’s Seniors’ Citizen Club on 01 November 2014 at Mallakam Sribaskaran Hall. At this camp, 06 medical officers including ENT specialist conducted the camp. More than 250 members participated and benefitted. It was recommended by medical officers to issue spectacles for 65 senior citizens and hearing aids for 03 members. It should be noted that wheel-chairs, white canes and spectacles are to be issued by Governor on 08thNovember 2014. Further, as per the request of the MOH of Tellipalai Dr.Nanthakumar, such type of medical camp will be conducted at resettled area of Keerimalai. Jaffna Public Library (யாழ் பொது நூலகம்) in Jaffna, Sri Lanka, is the famous library in Sri Lanka by historical and Sri Lankan civil war. It functions under the Jaffna Municipal Council. The library was built in 1933 and burnt in 1981. During early 1980s, it was one of the biggest libraries in Asia, containing over 97,000 books and manuscripts.In 2001, rehabilitation of the library was completed with new structure and new books. Even though, old books and manuscripts were not replaced. Jaffna Municipal Council of the Jaffna District in the Northern Province has been awarded “Swarna Purawara” Certificate for winning the 1st Place by the Jaffna Public Library. Jaffna Public Library won the first place at the Awards Ceremony for the Best Public Libraries in Sri Lanka which was organized by Ministry of Local Government and Provincial Councils together with University of Kelaniya-Department of Library and Information Science. Minister of Traditional Industries and Small Enterprise Development Douglas Devananda and Governor of the Northern Province GA Chandrasiri took part at this celebration of the success which was held at Jaffna Public Library on 27th October 2014. Now Days, Success is observed in almost at every sector of socio – economic fields of northern people. Governor wishes the relevant officials who brought the success.